These oral secretions contain chemical compounds, called elicitors, which alert the plant to the herbivores presence. Where do these elicitors come from? The ventral eversible gland (VEG), which plays a role in caterpillar defense, seemed like a likely candidate because it was a secretory structure that came into contact with the plant while feeding. Using a heated pin, Dr. Simon and his co-workers destroyed the VEG and compared the ablated beet armyworm caterpillars to those with their VEG intact. They confirmed that the VEG secretions induce defenses in tomato plants (Solanum lycopersicum) that include increased expression of defense-related genes and emission of volatile organic compounds (VOCs). Thus, plants defend themselves by recognizing VEG originated elicitors and triggering their defense machineries. Next, Dr. Zebelo shifted his attention towards investigating a unique relationship between plants and plant-growth promoting rhizobacteria (PGPR). PGPR colonize the roots of plants and have been shown to promote plant growth through nitrogen fixation, hormone synthesis, nutrient uptake, and reduced plant disease. Dr. Zebelo and his co-workers are interested in how rhizobacteria mediate plant defense against insects. Dr. Zebelo and his colleagues were interested in seeing if PGPRs change the composition of VOCs. VOCs can deter herbivores and attract parasitic wasps which gladly parasitize the herbivores. They used a model system consisting of cotton (Gossypium hirsutum), beet armyworm (S. exigua), and a parasitoid wasp (Microplitis croceipes) to investigate the effect of treatment of cotton plants with single strain (INR7) or mixture of strains (Blend 8 and Blend 9) of PGPR (Bacillus spp.) on plant chemistry and plant-insect interactions. By inoculating cotton plants with strains of PGPR, collecting volatiles from collecting chambers (Fig 2), and then analyzing the quantity and quality of VOCs, it was became clear that PGPR cause the plants to produce more VOCs. Following these results Dr. Zebelo and his co-workers tested whether the VOCs emitted by PGPR inoculated cotton plants affect the oviposition behavior of armyworm moths and the activity of parasitic wasps. Interestingly, beet armyworm moths laid fewer eggs on PGPR treated cotton plants and these PGPR treated plants were more attractive to parasitoids. Gossypol is a secondary metabolite which has been linked with helping cotton plants protect themselves against herbivory by decreasing herbivore fitness. Dr. Zebelo and his co-workers questioned how PGPR affects the biosynthesis of gossypol and affect the feeding behavior of armyworm caterpillars. In a series of laboratory and greenhouse investigations, they demonstrated that PGPR treatment elicits the induction gossypol-related gene expression and this leads to increased levels of gossypol in cotton plants, which reduced herbivory by beet armyworm caterpillars. This fascinating world of microbe-plant-insect interactions has important implications for agriculture. By exploring the largely unknown world of volatile ecology, we can identify new compounds that people can use to manage pests. However, Dr. Zebelo cautions against making too many generalizations at this early stage. He reminds us that these interactions vary across plant, insect, and PGPR communities and are extremely complex, meriting additional research in this promising field. Felton G. (2008) Caterpillar secretions and induced plant responses. In: Schaller, A., editor. Induced Plant Resistance to Herbivory. Netherlands: Springer. Chapter 18, 369–387. Zebelo S., Piorkowski J., Disi J., & Fadamiro H. (2014). Secretions from the ventral eversible gland of Spodoptera exigua caterpillars activate defense-related genes and induce emission of volatile organic compounds in tomato, Solanum lycopersicum. BMC Plant Biology, 14(1), 140. Zebelo S., Song Y., Kloepper J. W., & Fadamiro H. (2016). Rhizobacteria activates (+)-δ-cadinene synthase genes and induces systemic resistance in cotton against beet armyworm (Spodoptera exigua). Plant, Cell & Environment, 1-9. Hanna Kahl is a first year master’s student in Cerruti Hooks’ lab researching the effects of intercropping on insect feeding guilds. Jonathan Wang is a PhD student in Raymond St. Leger’s lab. He is studying Drosophila immunity and fungal pathogenesis. An expert in her field as an investigative curator at the Smithsonian, Dr. Hannah Wood spends her time combing through leaf litter and examining tree trunks in Madagascar, Australia, New Zealand, South Africa and South America in pursuit of tiny and unusual predators. She is investigating members of a small group of unique spiders known as the palpimanoids (Palpimanoidea). These arachnids may be small, (many measuring less than 10 mm in length) but these spiders are the stuff of nightmares for their prey. The highly modified cephalothorax (combination of the head and thorax) and elongated chelicerae (the spider’s jaws) make them excellent predators, well-adapted to their potentially dangerous and fast moving prey. Within the five known extant families of the Palpimanoidea, some are spider specialists, feeding only on other spiders, while some may subsist on small soil-dwelling arthropods, like Collembola. These spiders not only have unusual physical modifications, but also have uncommon methods of hunting, restricted distributions across the globe, low dispersal abilities, and can be traced back millions of years in the fossil record. These qualities make them exciting prey for Dr. Wood, as she strives to learn how these tiny hunters developed their unique characteristics. Palpimanoids have evolved over millions of years to use very unique methods to catch their prey. The two families of particular intrest to Dr. Wood are the Mecysmaucheniidae and the Archaeidae. In contrast to more typical spiders, these palpimanoids have elongated carapaces (the hardened cover over the cephalothorax) with a modified horizontal chelicerate muscle orientation, which is repsonible for operating their specialized, lengthened and especially mobile chelicerae. 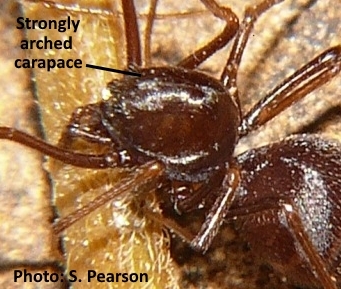 One family that has captured the attention of Dr. Wood is the trap-jaw spiders (Family: Mecysmaucheniidae) which are native only to the cold mountain forests of New Zealand and southern South America. They use their jaws like a bear trap; they hold their long chelicerae out and open, which then snap shut when prey is close enough. Dr. Wood’s dicovery of this unique mechanism is the first of it’s kind among arachnids. The speed at which some of these trap-jaw spiders are able to close their jaws is astonishing, particularly in a New Zealand species, which Dr. Wood has had difficultly observing even using a high-speed camera recording at 40,000 frames per second. Interestingly, this uncommon ability has evolved separately four times within this family. Furthermore, the trap-jaw spiders have developed a mechanism that allows them to store up large amounts of energy, which they then release at once to generate a greater force and speed to snap their chelicerae shut than would be possible with muscles alone. Dr. Wood is using CT scanning technology to get a closer look at the morphological mechanisms behind their incredible speed. In the mysterious forests of Madagascar, Australia and South Africa, Dr. Wood has investigated a close relative to the trap-jaw spider, known as the pelican spider (Family: Archaeidae). Pelican spiders have an even more an extreme carapace modification, which lends them the visual likeness to their namesake, pelicans, but you won’t see these minute predators diving for fish; they are spider specialists. These elaborate morphological adaptations have evolved to compensate for the muscles necessary to work their highly elongated chelicerae, which keep their potentially venomous prey at a distance when they strike. These extraordinary arachnids impale their prey with their venomous fangs positioned at the tip of their chelicerae, until their prey are immobile and no longer a threat, before lowering them to their mouthparts for consumption. Dr. Wood has observed the diversification of these spiders on Madagascar and compared them to other restricted populations in Australia and South Africa to determine the evolutionary pressures acting on their diversification. This one of a kind research is not only interesting, but improves our understanding of evolution and speciation. Jackie Hoban is a first-year master’s student in Paula Shrewsbury’s lab studying emerald ash borer biological control. Jen Jones is a first-year PhD student in Bill Lamp’s lab studying mosquitoes.